Russia's second city (after Moscow) and one of the great European metropolises – in the same league as Paris or Rome. A tourist magnet of the first order, it has a few points of interest for those interested in the darker sides as well, mostly related to WWII and the Soviet era. More background info: St Petersburg was founded by Tsar Peter the Great in the early 18th century – in fact it is a planned city, specifically commissioned by the Tsar to rival other great European capitals and seats of power with representational buildings galore, many on the grandest scale to be found anywhere. That was certainly achieved, thanks also to a large number of the foremost architects specifically hired for the project. 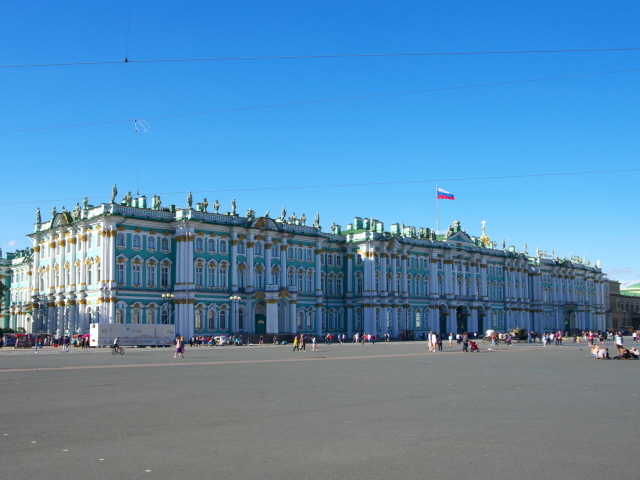 Once in place, St Petersburg served as the capital of the Russian Empire until its fall, up to the end of Tsarist rule in the 1917 Russian revolution, after which Moscow was declared the capital of the new Soviet Union. As if to add insult to injury, the city was also deprived of its name. First it was briefly renamed Petrograd, and after Lenin's death in 1924 its name was changed to Leningrad. It continued to be known under this name all through the reign of Stalin and throughout the Cold War. Only with the collapse of the Soviet Union in 1991 did the communist-inspired name cease to be regarded as acceptable – and so the city reverted back to its original name of St Petersburg. The city's darkest hours came with WWII, when Nazi Germany invaded the USSR and pushed right up to the city limits of Leningrad. Rather than conquering it outright, though, the Germans laid siege to the city from September 1941. This turned out to be one of the longest, deadliest and most tragic sieges in all history. Hundreds of thousands, if not possibly a couple of million (sources vary) inhabitants died … of hunger or the winter cold. Most shockingly, perhaps, are the stories of cannibalism that some desperate people resorted to in order to survive. Only after nearly 900 days the siege was finally lifted when the Red Army retook the city in January 1944. The story of the "Leningrad Blockade" (as it is more commonly known locally) is told in a dedicated museum and on tours along the "Road of Life" through which the city received supplies to keep it (just about) alive..
Of course, being one of the main cities of the Soviet Union, Leningrad also had its share of the USSR's home-made terror and tragedy, and this, too, is now captured in a few specialized museums. Despite its population of nearly 5 million and sprawling area, one especially striking characteristic of St Petersburg is its uniform "low-profile" skyline – that is to say, no high-rises that disturb the baroque and classicist look too much, thanks to a rule that no buildings are allowed to be taller than the old spires of the Peter and Paul Cathedral (the only exception to date is the TV tower. That said, though, the outskirts still feature those endless rows of drab prefab apartment blocks familiar from every Eastern Bloc city. Still, the citizens of St Petersburg are said to be the only ones in Russia who actually look down on Moscow, such is their pride in their city. The inner-city architecture is indeed immensely pretty, but actually not particularly representative of Russia at large. The look is much more Central European than Eastern. Typical examples of Soviet monumental architecture are also comparatively thin on the ground here. Apart from the relatively unchanged architectural integrity of St Petersburg's cityscape, lots has changed since my first visit back in 1987, when the USSR still existed and the city was called Leningrad. Gone are the Soviet propaganda posters, the drab shop windows with nothing beyond neatly stacked pyramids of canned food with bland labels that hardly gave an indication of the possible contents. Churches are no longer ramshackle storage facilities, and most of the inner-city façades have seen substantial facelifts. In that sense the city looks more presentable now than ever before. However, now there is also commercial advertising everywhere and the shops are well-stocked with local wares and international (standardized) brand-name items, the streets are full of flashy SUVs, and the people are well-dressed and fashionable (including tattooed hipsters galore!). While this has taken much of the former “exotic” Soviet atmosphere away, it is certainly to be welcomed that both residents and tourists are now catered for by plenty of restaurant choices and that practically everything you might want is amply available. Like Moscow, St Petersburg has firmly arrived in the capitalist First World (with all its merits and disadvantages). 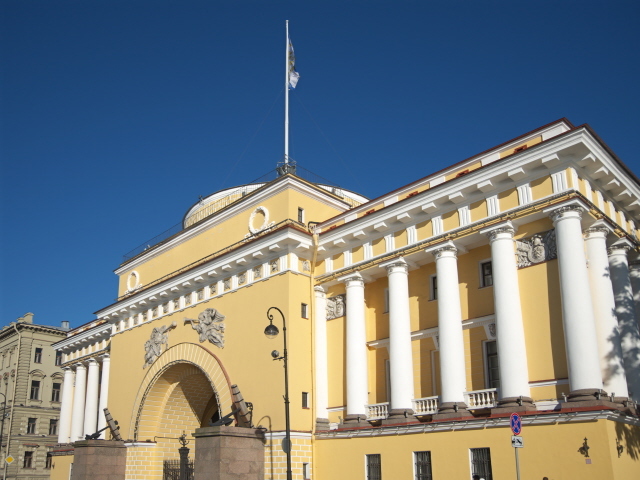 - Siege of Leningrad tour along the "Road of Life"
In addition there are several places dotted around the city related to Soviet Russian history – in fact right from its earliest beginnings. The Russian October Revolution started in St Petersburg (then called Petrograd), with the storming of the Winter Palace. The signal for this, so legend has it, came from a blank shot fired by the cruiser Aurora. And this is still an important tourist attraction. The gun in question is specially marked by a gold plaque. How much of the boat is original is a bit unclear. I remember that at the time of my first visit to this city, in February 1987, i.e. when it was still called Leningrad, the cruiser had been towed away to some shipyard for “refurbishment”, and there were rumours that in fact the Soviets may have decided to build a replica instead. According to Wikipedia this is only partly true: apparently only the below-waterline hull was replaced, so the rest is presumably original, including the historic gun. You can visit the boat, which has been a museum ship since the 1950s. 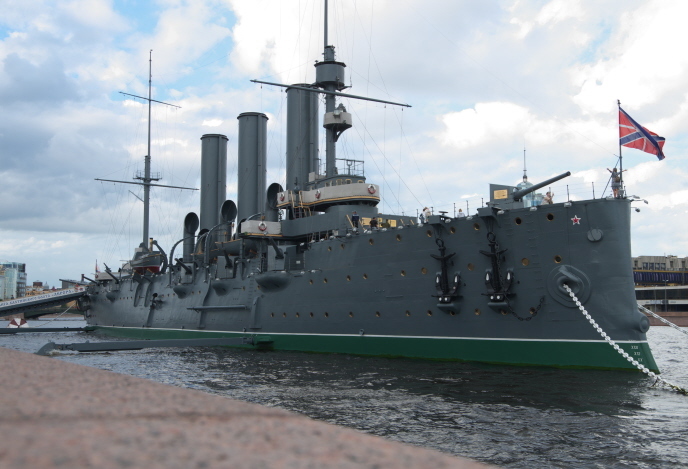 Now administered by the Central Naval Museum, the Aurora is moored to the east of the Peter & Paul Fortress on a side arm of the Neva River (open Tuesday-Thursday and Saturday-Sunday from 10:30 a.m. to 4 p.m., admission 300 RUB). When Lenin returned to Russia to lead the revolution, he arrived by train at Finlandskiy Station, so it is fitting that the space in front of the station is called Lenin Square and still has a Lenin statue on a plinth. It's one of those with him holding his hand out forward as if to show the way towards socialism, but his famous hat is neither on his head nor clutched in his fist, as it is depicted more commonly, but nestling in his coat's side pocket. Lenin Square is to the east of the Aurora over on the Vyborg Side of St Petersburg, between the Finlandskiy Station and the banks of the River Neva. A bit further along the northern riverbank to the east of Lenin Square is the infamous Kresty Prison, an imposing, brooding, red-brick ensemble of five-storey cross-shaped cell blocks, a large chapel and various ancillary buildings. 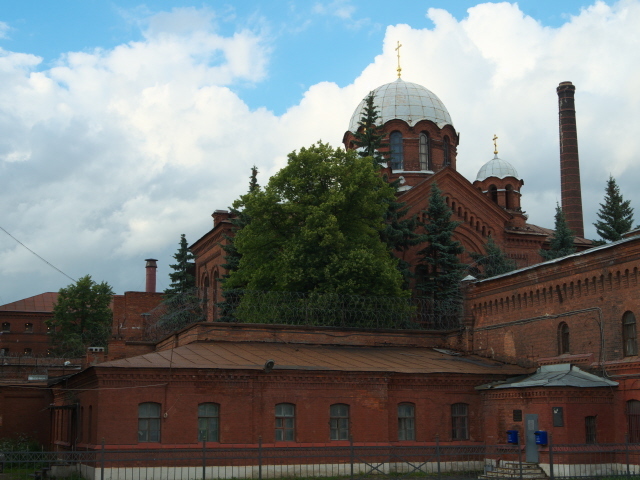 Built in the late 19th century, it held various political prisoners of the Russian Empire (including Leon Trotsky), and after the October Revolution members of the unseated government. It remained in operation throughout the Soviet period and beyond. At the time of my visit in the summer of 2017 it was clearly still in operation. Apparently, though, there are plans to close the outdated prison and relocate the inmates to a newly built facility on the edge of town. At some point at least there were guided tours available (of a working prison!) and a small museum. There is still conflicting information about this, some sources still mention the tours, others say they were discontinued years ago (the official website says “currently closed”). When I was there I certainly saw no indications of any public access and no mention of tours. So the buildings were only to be “admired” from the outside. Fittingly, just across the river on the southern banks of the Neva, there's a monument honouring the victims of political repression. Erected in 1995, it features a stylized barred window between blocks of granite and some barbed wire, as well as two sphinx-like sculptures whose faces have two halves, the one parallel with the street and residential houses is normal, but the one facing the prison across the river is stripped back to a skull. It is quite striking. Heading back westward along the south bank, the big modernist block standing tall above the classicist buildings around it is the so-called “Bolshoy Dom” (meaning simply 'big house'). This was the Leningrad HQ of the KGB, and now houses the offices of the successor organization FSB. As such it is not publicly accessible, of course. Yet it has lost some of its former intimidating aura these days (though not all of it!). In stark contrast to Moscow or Minsk, St Petersburg doesn't have much of the typical Stalin-era architecture. One stunning exception, however, is the grand former House of Soviets ('Dom Sovietov') south of the centre at Moskovskaya metro station, not far from the Monument to the Defenders of Leningrad. The façade of the House of Soviets (“Dom Sovietov”) is adorned with a monumental frieze with oversize socialist-realist bas reliefs featuring tractors, tanks and determined-looking revolutionaries and workers. In the centre of the square in front of this imposing edifice stands another grand Lenin statue, an even more flamboyant depiction of the man than at Lenin Square (see above) with a coat flying in the wind and a finger pointing downwards to the (now mostly absent) masses he's apparently addressing. Along the street that runs past the Dom Sovietov and Lenin are some more functional Stalinist buildings, big apartment blocks mostly, as well as a few later such monsters of typical Soviet design. Well worth a look around. Beyond all that, there are a few more attractions that I've not had time for yet, including the Krassin icebreaker near the shipyards – very similar in looks to the "Lenin" in Murmansk, but from the pre-atomic era – or the Artillery Museum, which beyond lots of big guns also has some large Cold-War-era missiles, or the Arctic and Antarctic Museum … refer to other city guides for details on those. Location: in the north-western corner of Russia on the easternmost reach of the Baltic Sea, near the borders with Finland and Estonia, and ca. 25 miles (40 km) west of the huge Lake Ladoga. Access and costs: fairly easy to get to, caters for all budgets, though not necessarily the cheapest end. Details: You can get to St Petersburg by virtually any means of transport, including by ferry (esp. from Finland or even from as far away as northern Germany), but most people will arrive either by train, especially when coming from within Russia (most likely Moscow), or by plane. There are now numerous connections to other European hubs. Getting around is for a good part possible on foot. Several of the sites mentioned above are within walking distance from each other, even though the distances to be covered can be considerable. For longer distances the metro (the second largest network after Moscow's) is of great help, and it's cheap and fairly easy to use. There is now much more signage in Latin script, so navigating is possible even without being able to decipher the Cyrillic alphabet. More and more signs in English are also being added. For buses and trolleybuses, however, it will still be necessary to have at least a working knowledge of Russian. Accommodation-wise as well as with regard to food and drink, St Petersburg these days covers the entire range – from budget hostels to swanky luxury all around. Restaurant menus now often come with English (sometimes also German or Chinese) translations, and at least some of the staff tend to have a decent enough command of English. All in all it's probably fair to say that St Petersburg is the place that is the most user-friendly for foreigners in all of Russia. For many tourists, summer is the best time to visit, especially June/July with the famous “White Nights”, when, thanks to the northern latitude of this city, the sun hardly sets and people are out in the streets throughout the night. However, this being peak season also means prices are at their highest and hotels get booked out, so plan well ahead. Winter is also popular, because in the snow St Petersburg looks especially charming, but daylight hours are short and it can get very cold. My fist visit in 1987 was in early February, and temperatures dropped to below minus 15 degrees Celsius. My latest visit was in early August, and summer was already on its way out, with plenty of showers, strong winds and temperatures often in the 15-20 degrees range. 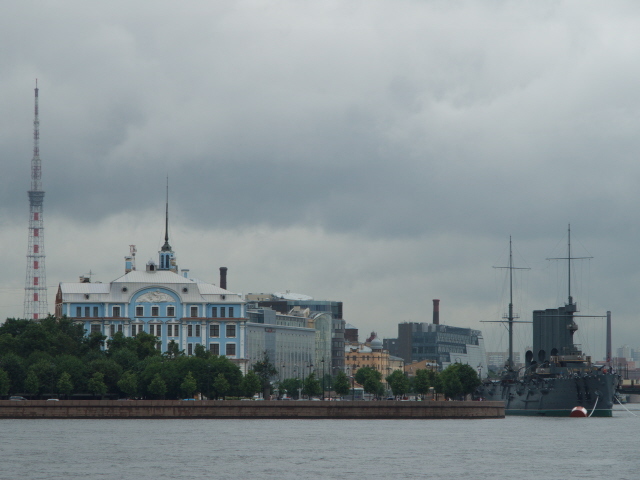 But apart from the rain, it was quite pleasant, whereas Moscow was still sweltering hot. Time required: About a week should be enough to do everything listed here. I only had five days when I last visited (in the summer of 2017) and my itinerary was often quite tightly packed, and not relaxing at all. So better allocate a little more time. If you also want to go beyond the dark sites and sample some of the rich other offerings of this marvellous city, then you will need at least another whole week, probably more. Combinations with other dark destinations: see Russia – given the city's location so far to the west of Russia on the Baltic Sea, it's actually easier to combine a trip here with visits to neighbouring countries such as Finland or the Baltic states (Estonia, Latvia and Lithuania). Moscow is within fairly easy reach all the same, and St Petersburg is also a departure point for trains (and planes) to the north, especially Murmansk. Combinations with non-dark destinations: St Petersburg is primarily a non-dark travel destination – and for more good reasons than can possibly be listed here. There's breathtakingly grand architecture on almost every corner, and truly outstanding examples include the world-famous Hermitage – one of the world's greatest art museums, the Admiralty, the Peter and Paul Fortress and Cathedral with its tall spire, and St Isaac's Cathedral, one of the world's largest dome churches (see also Vatican for the very largest), also Kazan Cathedral (modelled on St Peter's in the Vatican), Smolny Cathedral, Alexander Nevsky Monastery, and so forth. 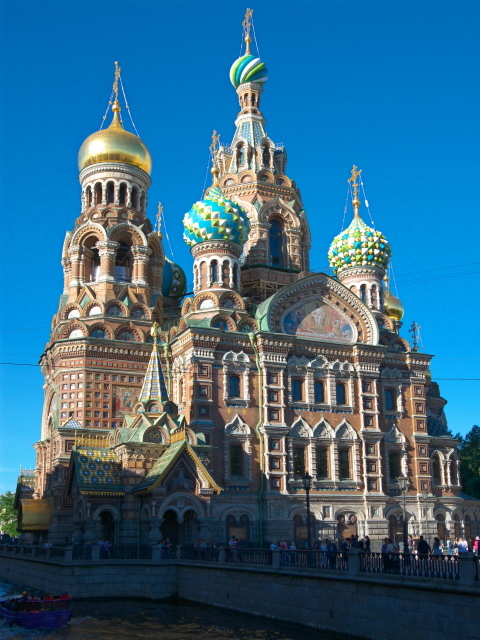 Another highlight is the iconic Church on the Spilled Blood (so called because of an assassination attempt on the Tsar that apparently took place here in 1881). It's a classic Russian Orthodox affair with lots of individually designed onion domes – and as such it is rather atypical for St Petersburg, much closer in style to the famous St Basil's Cathedral on Red Square in Moscow. But it's not just those famous buildings that characterize St Petersburg's general beauty, lots of commercial and residential buildings too add considerably to it, such as the many art nouveau buildings (cf. Riga) or the flamboyant Singer Building on the city's main shopping street, Nevsky Prospekt. 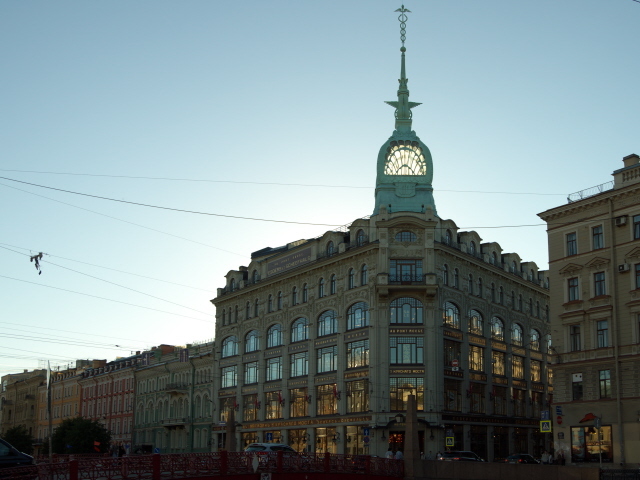 The latter avenue is also where Gostiny Dvor, one of the world's first shopping malls, can be found. Even outside the city the grandeur continues, e.g. with the expansive summer palaces of the Tsars such as Peterhof or Catherine Palace (where the famous amber room used to be – now only in reconstruction, since the original was stolen by the Nazis in WWII and remains “lost” to this day). Peterhof can be reached from the city centre by means of very Soviet-style hydrofoils! However, as I said, it's way too much to be captured in any detail here – grab a standard guidebook instead. See also Russia in general.